Figs are a fantastically healthy dessert and when roasted, they become sweet, sticky and succulent. This recipe roasts figs with honey and marsala wine, resulting in a sweet and juicy dessert. Serve the figs with some sweetened mascarpone cream. Preheat the oven to 200C and cut a deep cross into each of the figs, slicing nearly to the bottom. Squeeze the figs to expose more of the juicy flesh. Drizzle the honey and the marsala over the figs and cook in the oven for twenty minutes. Serve the figs immediately from the oven, drizzled with the honey and marsala syrup. If you don't have any marsala wine, you could use vanilla syrup or vanilla extract mixed with water to roast the figs in. Serve them with sweetened cream or custard if you're going for a more English dessert. This recipe serves four people. 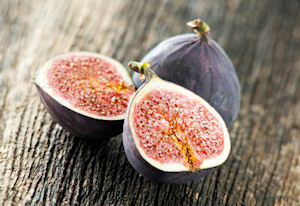 Back to the Fig Recipes home page.